At long last, George Walker’s Sinfonia No. 5, “Visions” will have its first public performance with Thomas Dausgaard and the Seattle Symphony on April 11 and 13. 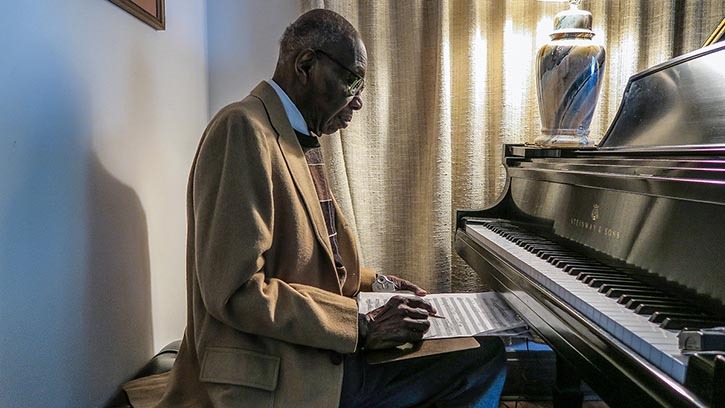 One of the preeminent American composers of the 20th century, George Walker spent the final years of his life in the self-imposed solitude of his home in Montclair, New Jersey. He worked into the early hours of morning, playing piano, working on his compositions and listening to recordings of his music. In Frank Schramm’s photos of Walker from those last years, the composer invariably appears surrounded by a sea of books about orchestration and music theory. An ever-changing stereo system dominates the room. That devotion to precision and quality was a hallmark of Walker’s meticulously crafted compositions. During his career he composed over 90 works for solo piano, voice, chamber ensembles, chorus and orchestra. Walker broke barriers throughout his distinguished career, first as a pianist and then as a composer, becoming the first black composer to win the Pulitzer Prize in 1996. It was one of many firsts for Walker, who was wary of the tokenization that such distinctions could bring. Born in Washington, D.C. in 1922, Walker grew up as part of a musical family, although neither of his parents had formal training. His father, also named George, was a Jamaican immigrant and a successful physician. It was his mother, Rosa, who urged that he start piano lessons at age 5. A gifted student, Walker seemed destined to be a concert pianist. He graduated high school at age 14 and attended Oberlin Conservatory. In 1941 he was admitted to the prestigious Curtis Institute of Music to work on his artist diploma. For Walker, composing started as a way to channel excess energy after spending hours each day practicing piano at Curtis. “I had so much energy that I wanted to do something else after spending hours practicing at the keyboard,” he told Strings Magazine in an interview from 2017. Walker made his solo debut with the Philadelphia Orchestra in November 1945, performing Rachmaninov’s Third Piano Concerto. Shortly afterwards he was signed by National Concert Artists and embarked on a European tour. Gradually, Walker found his way into teaching after earning a doctorate from the Eastman School of Music in Rochester, spending a few years teaching at Smith College before spending most of his career at Rutgers University at Newark. Along the way he increasingly turned his time and attention to composing, creating what would become an impressive catalogue of original and challenging works — and an unjustly neglected treasure of music. Walker studied composition with his most influential mentor, violinist and composer Rosario Scalero, while a student at Curtis. Scalero, who also taught American composer Samuel Barber, imparted a sense of rigor and discipline that remained with Walker throughout his career. That force of will sustained a remarkable creative vitality throughout Walker’s life, reminiscent of Elliott Carter and Henri Dutilleux, who both continued composing into their nineties. His early works, including the Pulitzer Prize-winning Lilacs, are firmly rooted in the romanticism practiced by American composers like Samuel Barber. After composing for nearly three quarters of a century, however, Walker’s music has undergone a transformation. His later works are more thorny, more aggressive, more dense, as he eschewed simple forms for more rigorous structures. The massacre of nine church members at the Emanuel African Methodist Episcopal Church in Charleston, South Carolina in June 2015 resonated strongly with Walker, who had visited the city a few months earlier. “The horrific events that occurred there and elsewhere will always remain etched in my imagination,” he told New Music Box in an interview with Frank J. Oteri. From the opening flourish in the orchestra, the music is agitated, restless, switching from idea to idea and rapidly through textures with outbursts of percussion declaratively punctuating each phrase. Starting about a third of the way into the work, Walker intersperses bits of narrated text throughout the music. After completing the score for Visions, Walker spent two years trying to arrange a public performance. At age 95, time was running out. Never one to wait, Walker hired an orchestra and conductor to create a studio recording so at least he could hear it. He released the recording through Albany records on January 1, 2018, a few months before he passed away at the age of 96. Three years after he finished the piece — and eight months after he passed away — Walker’s Sinfonia No. 5 will finally have its first public performance with Thomas Dausgaard and the Seattle Symphony. If you close your eyes and let your imagination wander during the concert, you can almost see Walker sitting, hands folded, listening, his music filling the hall. Get your tickets for the world premiere of George Walker’s Sinfonia No. 5, “Visions” on April 11 and 13 online or by calling the Ticket Office at 206.215.4747. Thomas Dausgaard’s performances are generously underwritten by Ilene and Elwood Hertzog through the Seattle Symphony’s Guest Artists Circle. Thomas Dausgaard’s performances receive additional support from the Scan|Design Foundation by Inger & Jens Bruun.